Green is the thing in March. Green is the color right now with St. Patrick’s Day approaching. Have you ever paid attention to flowers with this color? 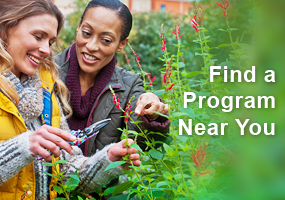 In the garden, green is the most common foliage color, yet one of the rarest flower colors. Green flowers are unusual, so when presented correctly, they add an air of sophistication to a planting and look good with every color. There are some naturally occurring green flowers, but many more have been “created” by breeding and selection. These floral oddities are a fun addition to the garden. Some plants that naturally come in green include orchids and aroids like Jack-in-the-Pulpit (Arisaema triphyllum) (not to mention a number of weeds with inconspicuous flowers, but who wants those in their garden?). Naturally green flowers of Cymbidium orchid (L), Pterosytlis orchid (LC), Arisaema triphyllum (RC) and Bells of Ireland (R). A Nicotiana with pale green flowers. Green flowers don’t look like much by themselves, as they tend to fade into the mass of green foliage and are best placed where they can be observed at close range. They make great ‘buffer’ and ‘blender’ plants, smoothing the transition between color schemes or having a calming influence on too strong a hue. Against yellow or red foliage they stand out without clashing. 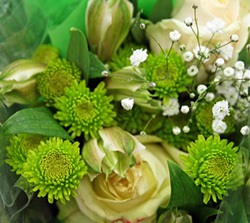 And they are great for interesting and dramatic cut flower arrangements. Hydrangea flowers often have a greenish cast. When incorporating green flowers in a planting scheme, opposite colors offer the most contrast, making them appear brighter. Combinations of the secondary colors green, violet, and orange are attention getters. Bright lime green, paired with bright pink, orange or purple causes the other colors to pop and look more rich and full of texture. Combining flowers in a gradual sequence of colors – those that appear next to each other on the color wheel – produces a more subtle, harmonious effect. We usually think of green as a cool, receding color, but the eye-catching hue of most green flowers is a “hot” chartreuse green. Chartreuse, a blend of warm yellow and cool green, is an effective accent color in nearly any color harmony. For more yellowish-green flowers, emphasize the green in them with a companion or background that is pure yellow or a warm, orange-tinged yellow. Green’s direct complement, red, may be overwhelming in pure hues, but the blend of cool blue and warm red in red-purple flatter both the advancing and receding hues. ‘Hulk’ China aster (Callistephus chinensis) – The green color of these blooms is actually the oversized green bracts surrounding the pale yellow center disks. This aptly named green-flowered aster is especially good as a cut flower. It produces a large number of stems on 2 foot plants over a period of several months. Successive sowings will extend the supply of flowers. Easy to grow from seed, but is frost-tender, so start indoors or wait until after the last frost to sow outside. ‘Emerald Tassels’ Love-lies-bleeding (Amaranthus caudatus) – tall plants (3-5’) with pale green, pendant inflorescences about three months after sowing. ‘Pony Tails’ is a mix that has a green one in it. 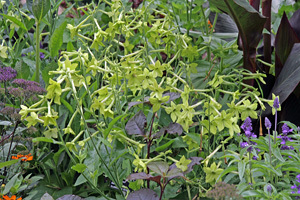 ‘Lime Green’ flowering tobacco (Nicotiana x sanderae) – really an intense yellowish-green that combines well with dark purple and dusky rose. 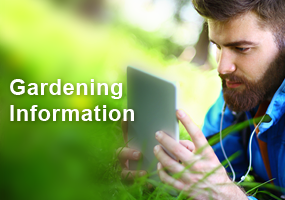 Upward-facing, trumpet-shaped flowers mix well with many other colors in the garden. Grows 2-3 feet tall. Flowers supposedly attract hummingbirds and are fragrant at night. 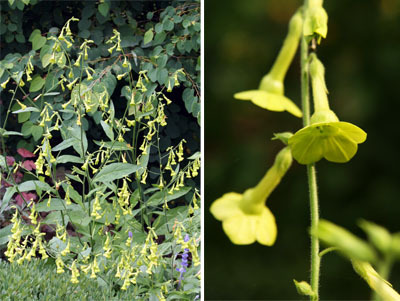 Nicotiana langsdorfii has wands of little light green bells hanging loosely on 2 foot plants. It is not fragrant, but does make a good cut flower. Zinnias – several cultivars offered, all with petals curled upward. Most of the green cultivars are not as prolific as their colored cousins and they have a tendency to become a sickly yellow in hot weather. ‘Benary Giant Lime’ – cool green, fully double blossoms on tall, straight stems. 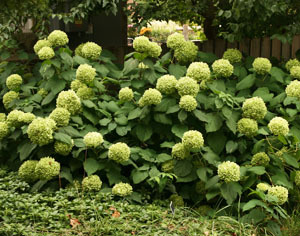 The flowers can be up to 4” in diameter on plants up to 4’ tall. They make excellent cut flowers. Supposedly more vigorous than ‘Envy’ with some disease resistance. 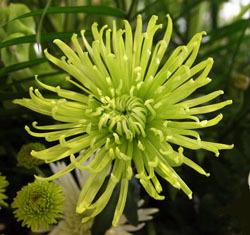 ‘Envy’ – this dahlia-type flower is a true, light green with a darker center, although it is somewhat variable in color from true green to pale yellow. It has full, double heads, growing only 2-2½ feet tall. Gladiolus – several cultivars, including ‘Green Bay,’ ‘Green Woodpecker,’ and ‘St. Patrick’s Day’ – but many open green only to quickly fade to yellow-green. ‘Green Star’ is rated highly as staying green. Spring bulbs – Narcissus ‘St. Patrick’s Day’ and Tulipa ‘Groenland’ , ‘Spring Green’ and ‘Evergreen’; ‘Flaming Spring Green’ tulips start off very green, then as they mature they become more yellowish-green and develop the maroon flames. Purple coneflower cultivars (Echinacea purpurea) – ‘White Swan’ has white flowers with green cones in the middle (until they mature and turn dark brown). ‘Green Envy’ has large 4″ flowers that emerge a lime green, then the petals develop a rose-pink flush tipped with lime green (more pink than green, not like the promotional photos). 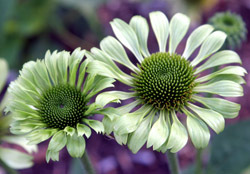 Echinacea ‘Green Jewel’. Photo by Ed Lyon. ‘Green Jewel’ has greenish, quilled petals. ‘Coconut Lime’ has short, white double petals surrounding a large, almost fuzzy-looking green center. Rosa ‘Greensleeves’ is a floribunda; ‘Green Ice’ and ‘Green Diamonds’ are miniature roses with white flowers that will have a soft green bloom when grown in shade; and Rosa chinensis viridiflora is an old rose (supposedly in cultivation since 1743). All are only hardy to zone 6, so would be difficult to grow in Wisconsin. Daylilies – many cultivars in the chartreuse range. ‘Lime Frost’ has pale cream-green flowers. ‘Frozen Jade’ is cream flushed with a green center. ‘Green Flutter’ is canary yellow with a vivid green throat. 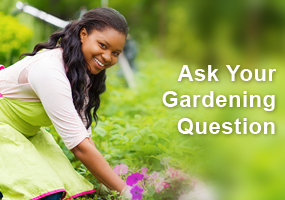 Note that soil pH affects flower color, so in some soils flowers may be more yellowish than green.